The rapidly evolving landscape for global business -- and the consequent need for IT to relate differently to businesses so they together serve their customers in innovative ways -- has to mean more than business as usual from technology suppliers. The Instant-On Enterprise, as HP defines it, is a data-driven organization that leverages technology for everything — but specifically to better address the ever-evolving needs of end-users. As users' expectations and experience change, so too must the ways enterprises relate to them, are perceived by them. The next several years will form a culmination of now-clear mega trends that have only just begun to roil conventional business practices. We're talking about pervasive mobile applications use, highly responsive cloud computing models, and knowledge-adept social collaboration. More than just these shifts, there also needs to be an increasingly automated, secure, and harmonizing management capability that combines and reinforces them. It takes a special kind of enterprise to close the expectation gap between what customers and citizens expect and what the enterprise can deliver. As these trends literally re-arrange business ecosystems and re-established the service delivery order, a gap will surely grow between the companies that master change and exploit enabling technologies -- and those that fall ever further behind. With that in mind, HP has rolled out new solutions that aim to help both business and government create their own Instant-On Enterprise. Not surprisingly, the driver of the Instant-On Enterprise is everything becoming connected and immediate, people expect responses regardless of sourcing and/or partner ecosystems — and within seconds instead of days. “It takes a special kind of enterprise to close the expectation gap between what customers and citizens expect and what the enterprise can deliver,” says Tom Hogan, executive vice president of Enterprise Sales, Marketing and Strategy at HP. 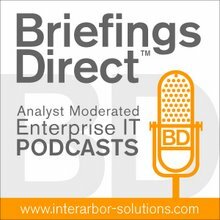 “The Instant-On Enterprise delivers differentiated competitive advantage, serving customers, employees, partners and citizens with whatever they want and need, instantly…"
New HP research reveals that the role of IT is shifting from chiefly being the administrator of the enterprise to becoming one and the same with the enterprise. This means enabling rapid, recurring business process improvements to meet dynamic customer demands, as well as gaining near-instant insights into shifting markets. Coleman Parkes research conducted for HP in October reveals that 86 percent of senior business and government executives believe they must rapidly adapt the enterprise to meet changes in consumer expectations. The research also indicates that 78 percent believe technology is the key to business and government innovation, and 85 percent indicated that in order to be successful, technology needs to be embedded in the business or government service. HP’s new solutions work to help enterprises and government leverage technology in ways that will meet those goals. HP sees it as a reinvention of how technology is used to deliver innovation at every point in the value chain. That covers the services that are delivered, the mobile devices that provide the access, and the global data centers required to power the Instant-On Enterprise. HP Application Transformation solutions work to help enterprises gain control over aging applications and inflexible processes that challenge innovation and agility by governing their responsiveness and pace of change. HP Converged Infrastructure solutions are engineered to drive out costs and provide the foundation for agile service delivery. HP promises this solution delivers the data center of the future. HP Enterprise Security solutions secures the IT infrastructure by people, processes, technology and content. These solutions aim to aligns security to meet business and government demands without losing flexibility. HP Information Optimization solutions deal with how information is gathered, stored and used. The idea is to harness the power of information and ensure its integrity and protection while delivering it in the context of the enterprise. Realizing that there is no one single delivery model that meets every end-user need, HP also introduced two new Hybrid Delivery services. HP Hybrid Delivery Strategy Service offers a patent-pending, model-driven framework to introduce hybrid delivery concepts into their existing environments. HP Hybrid Delivery Workload Analysis Service offers experts that gather service usage and demand profile data, and then develop a set of recommendations on how to best characterize and combine workloads in hybrid environments.